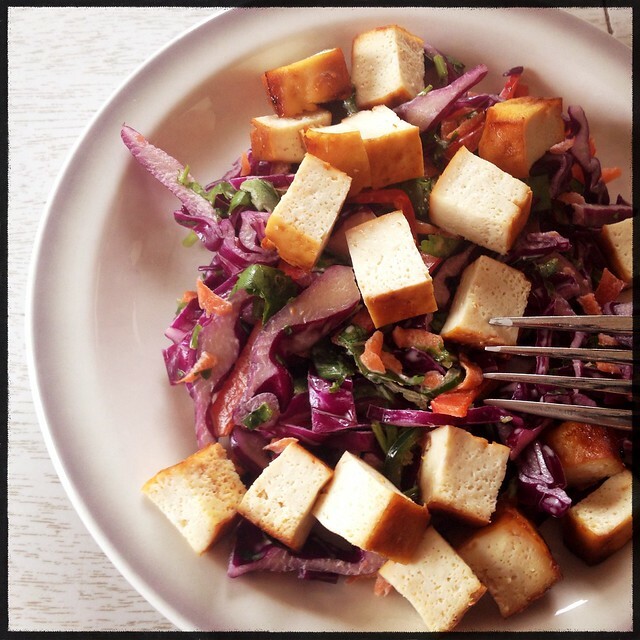 Purple Slaw, Spicy Baked Tofu, and Food52 Love. I came a little late to the Food52 party, but still it's a website I've enjoyed for several years. There is always plenty of inspiration when the pantry seems bare but really is well stocked, and the community setting is comforting in the big world of Internet food. When I see something tagged with "Genius Recipe" or "How to Make _____ Without a Recipe" (or Not Recipes as they are called), I'm always sure to give particular attention. I think about cooking without recipes pretty frequently - especially since I tend to cook what I find on sale and also what needs to be used up, often on the fly during this homeschooling year. Last week, organic purple cabbages were on sale at my food co-op and when shopping on that cool Sunday evening after a weekend out of town with my boys, I couldn't shake the feeling that I needed cilantro and a fresh hot pepper and and some kind of slaw. The next day, half of it became a medium-spicy concoction that really hit the spot. What I had originally thought would be more Asian in flavor turned out to be more Southwestern/Mexican and I couldn't get the "without a recipe" moniker out of my head. The second half of the cabbage was made into a similar slaw, only instead of letting the cabbage drain in a mixture of salt and sugar, I decided to just add some candied jalapenos and their juice. It was spicier, and even better than my first attempt. I'm pretty sure you could add anything to the slaw to make it good; just be sure to keep a rainbow of colors. Purple slaw, topped with spicy baked tofu. I'm not so good at typing up a non-recipe - they beg to be told word of mouth. Basically, toss the cabbage and salt (and a tad of sugar if you want it nuanced with sweetness) together (you could add the peppers and carrots to the salted mix if you like, or if you forget add them after). Let it stand at room temp for an hour to draw out some moisture. Then drain it well and add the rest of the ingredients. You can omit the mayo and use Vegenaise, or skip the creamy mayo component altogether and use a couple tablespoons of cider or rice vinegar. Just taste and go with it! It tastes better after it sits a day, and stays remarkably crunchy for nearly a week. 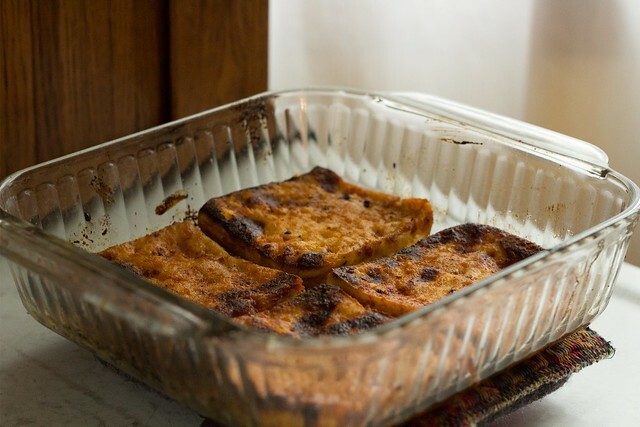 Baked tofu is another non-recipe. I used to follow a more rigid approach to baked tofu, but recently I've been making it this way with exceptional results. I cut a 1 pound block of firm tofu into two even slabs, press it for at least a half hour but usually longer in a makeshift contraption of dish towels and plates and weights (cast iron pans). Then I slice the drained tofu again into 4 total slices. In the bottom of a baking dish, drizzle in a fair amount of sriracha, an equal amount of maple syrup (or honey), and roughly the same amount of olive oil. Turn to fully coat, add a little salt and pepper if you feel like it, and let it sit overnight if you want - or just bake it at 425 right away. I've been using my toaster oven to bake, which probably runs a little hotter than 425 due to the compact baking space. I just watch it, and turn it about halfway through. When it looks done, it's done. I like nibbling it warm, or cubing it cold and adding it to other things. 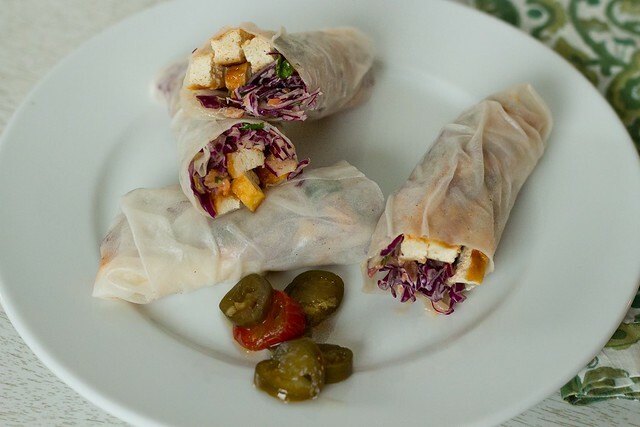 Like the purple slaw (picture above), or these spring rolls I made for lunch today using the same slaw and more candied jalapenos... I am totally remembering these for picnic season. 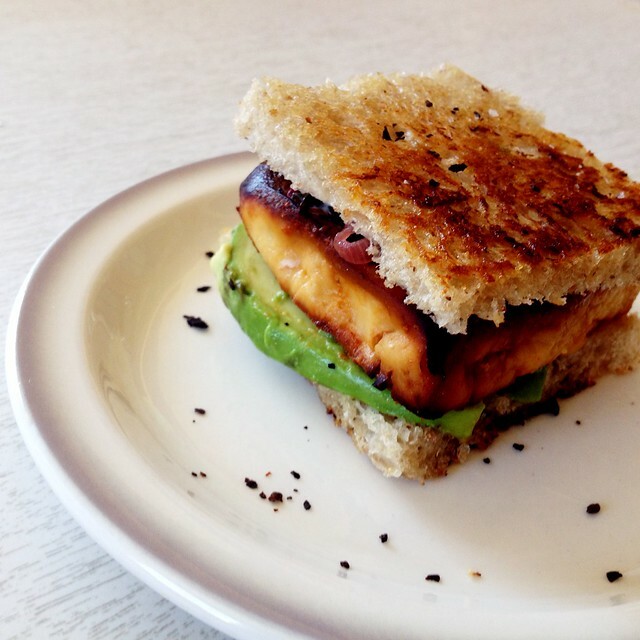 Last week, I used a spicy tofu slice in a grilled sandwich which is also worth noting! I had a few tablespoons of leftover red chard from the night before (just fried in olive oil with shallot - I'm always surprised at how good greens are this way, and I shouldn't be), some avocado, and sourdough with the crusts cut off and spread on the outside with mayo. Last summer, Food52 highlighted Gabrielle Hamilton's method for grilled cheese, which was the way a friend of mine made grilled sandwiches more than a decade ago but I had forgotten about it. It was a wonderful sandwich. While spreading the Food52 love around, I will mention the latest book to come from their collective: the Genius Recipes book. I haven't read it yet, but it's on my list. It includes things like Marella Hazan's tomato sauce and Michael Ruhlman's chicken. Simple things that always work and are always good - and now all found in one tome. I don't really need to read it before being sold on it. Genius is genius.